"Technology companies are scrambling to fix serious security flaws affecting computer processors built by Intel and other chipmakers and found in many of the world’s personal computers and smartphones. Researchers at Google’s Project Zero and academic institutions including the Graz University of Technology in Austria discovered the problem last year and disclosed it Wednesday." 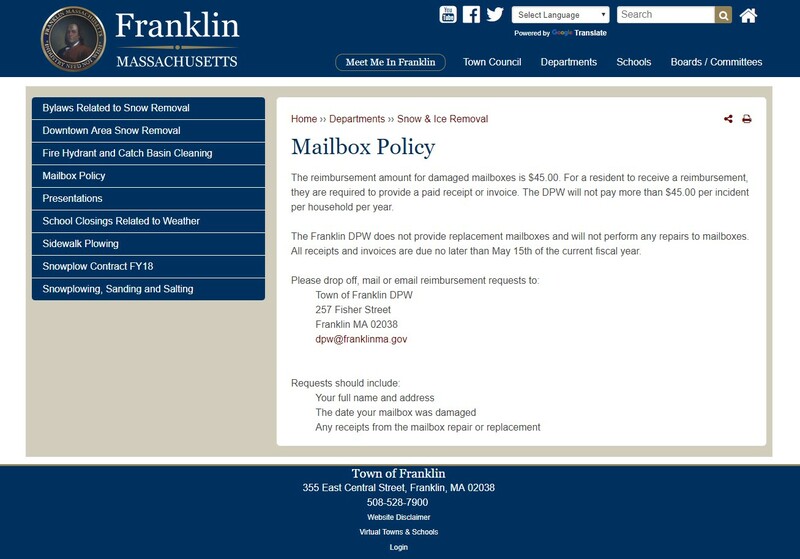 "Residents who have their mailboxes taken out by a plow during storms may see an increase in their reimbursement by the town. The Board of Selectmen this week voted to increase the amount the town offers to $50, up from $25. Town Administrator Michael Boynton raised the matter at the board’s Tuesday meeting, saying he felt $25 was on the low side. “I’m beginning to think $25 is from a day gone by,”′ he said, noting that the standard mailbox likely costs closer to $50." "The reimbursement amount for damaged mailboxes is $45.00. For a resident to receive a reimbursement, they are required to provide a paid receipt or invoice. The DPW will not pay more than $45.00 per incident per household per year. 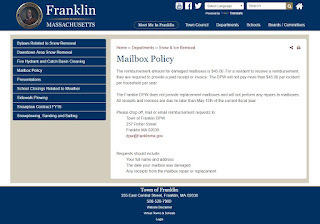 The Franklin DPW does not provide replacement mailboxes and will not perform any repairs to mailboxes. All receipts and invoices are due no later than May 15th of the current fiscal year."